Independent academic high school for girls / Secondary school for girls Catholic private school with state recognition Founded in 1945 by Fr Kentenich close to the Original Shrine. Education for girls with a broad impact in the area surroun- ding Schoenstatt. Co-operative academic high school and secondary school – with its own school administration. The only school for girls in the region with the possibility for girls to develop the strengths specific to women. 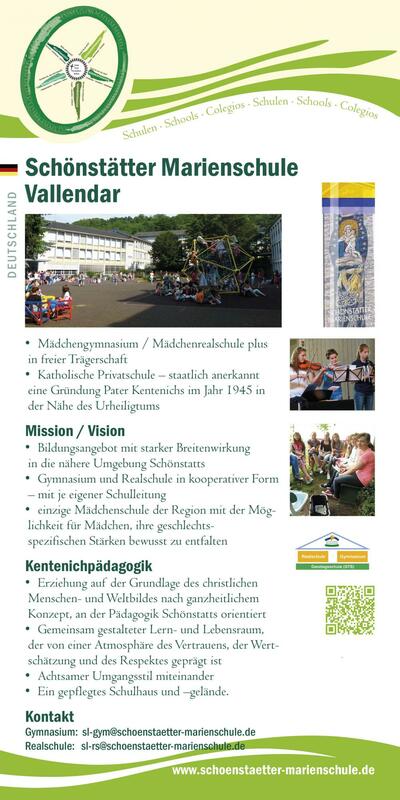 Kentenich Pedagogy Education based on a Christian image of the human person and world according to a holistic concept, and orientated to Schoenstatt‘s pedagogy. An area for learning and living created together, which is mar- ked by a climate of trust, mutual appreciation and respect.